"The handy machine-made Syrah glass of the space-saving glass collection O Wine Tumbler is perfect for all adventurous people who do not want to miss out on true wine enjoyment anywhere. The handy single package is perfect for travelling. This means that you always have your glass ready to hand - whether for a cosy picnic or a mountain tour. 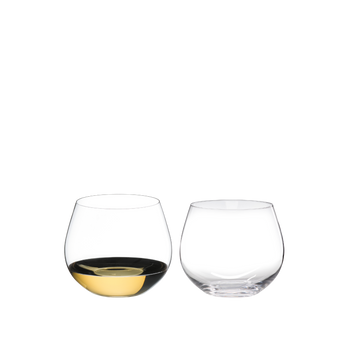 This glass attracts attention through its stemless design. This makes it less susceptible to glass breakage and easy to put into the dishwaser. Featuring the bowl shape of the VINUM XL Syrah glass, which was introduced by Georg J. Riedel after a visit to the Guigal family, this glass is designed to deliver the classic aromas of toast and black olives, which are typical of this wine. "Big O" complements the popular ""O Wine Tumbler"" glass series for big, bold and concentrated wines. These glasses are ideal for everyday use and for every occasion. It is fun, feels good to hold, looks trendy and it works! All RIEDEL glasses are dishwasher safe. "